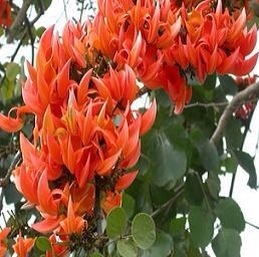 Palash tree bears beautiful red flowers. The tree itself is not beautiful. A stage comes when whole jungle with these trees blooms and it seems that entire area is on fire. Due to this, the flower is called flame of forest. We lived in Panvel which is area surrounded by woods, undulating land with hills of peculiar shapes. There in these woods were plenty of Palash trees. They took on beautiful garb of flaming red colored flowers. All day bees and birds like crows and mynahs visited these trees. The name of battle of Plassy is derived from the Palash tree which grew in abundance in the area of battle. Name of this flower occurs in Literature numerous poems and songs. In English the tree is called “Butea Monosperma”. In Hindu mythology, the tree is a form of Agnidev, God of Fire. It was a punishment given to Him by Goddess Parvati for disturbing Her and Lord Shiva’s privacy. Wants to know about the medicinal uses of the ‘kamarkas’.Kamarkas is the releas from the palas tree.